In one of the most enduring classics of contemporary literature, author Richard Adams enthralled millions of readers by creating a glorious world of danger and discovery at once uniquely strange and strikingly similar to our own. Come back now to this remarkable society hidden beneath the tall grasses and open fields; to old friends and new heroes whose courage and tenacity are tested at every turn by predatory nature and the short-sighted cruelties of man. 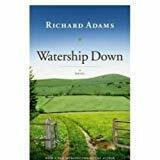 Come back to the excitement and enchantment, to the heartsoaring wonder of a place called Watership Down.